His playing days may be at an end, but Leon Barnett knows just how blessed he has been to have enjoyed a long and successful football career - and he has the memories, souvenirs and medals to prove it. The defender, who turned 33 on Friday, revealed on Monday that he has been advised to retire from playing professionally due to a heart condition, and it is obviously a bitter pill for him to swallow. But Barnett is also grateful that he was able to enjoy a fulfilling career before it was all brought to a premature halt. In all, the Stevenage-born centre-half played more than 350 senior matches and competed in all four divisions of the English leagues, including two stints in the Premier League. He also played in the Europa League and in the Community Shield at Wembley for Wigan Athletic, and in his career he won the Championship title with West Brom, also won promotion to the top flight with the Canaries, and landed a league one title winners’ medal with Wigan. They are career stats for anybody to be proud of. On top of the silverware, Barnett also played with some top quality talent, and against some of the best players in the world - even if he admits that wasn’t always a pleasurable experience at the time! “I hate saying who the best player I have played against is, because the Premier League is the best league in the world, with all the best players in the world in it,” said Barnett, who joined the Cobblers from Bury on a free transfer in the summer of 2017. “But obviously Luis Suarez was one the most annoying players, and one of the best, and when I was at Norwich he scored something like nine goals in three games against us! Barnett would not dare to suggest he matches those players or many others in the top flight for playing ability, but he admits he would like to think he did at least he make life difficult for them as they tried to strut their stuff. He prided himself on his effort, application and determination, and he now intends to pass on those attributes to young players as he prepares to switch his career to a life in coaching. “Every single one of those players named, and others in the Premier League, gave me a hard time, and I would like to think I have given them a bit of a hard time too, whether it was through playing or just being annoying and aggressive,” said Barnett. “That was my job really, to be aggressive, be annoying and stop people scoring, but it has come to an end now. As well as the memories, Barnett says he has picked up souvenirs and mementoes throughout his career, and they will be on display at his home so that his three children, aged eight, six and 10 months, will be able to appreciate what their dad’s football career was all about as they grow older. “I have a room in my house, where I like to show shirts I have collected and different memorabilia,” said Barnett. “I will now try and get my shirt from my last game (against Bury in October), and my boots and shinpads, and put them in there. There have been stacks of messages of support for Barnett following the announcement of his retirement, with former clubs, ex team-mates, and supporters of all teams he has played for showing their appeciation and affection for him. 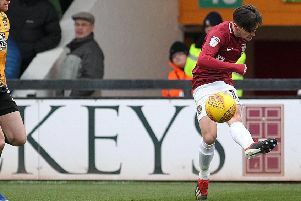 He is very appreciative of all of that, but he made special mention of the backing he has received from his Cobblers team-mates, who only discovered the extent of Barnett’s health issues ahead of last Saturday’s 2-2 draw with Grimsby Town at the PTS Academy Stadium. “On Saturday I spoke to the players in the changing room and wished them all the best,” said Barnett, who made his senior playing debut as a 16-year-old at Luton Town. “They were still asking me what was going on, so I told them all which wasn’t too bad, because I thought I would struggle with that. “Then on Saturday night I thought I had better text them and say ‘don’t put anything on social media until anything has been said officially’. “That was when they sent me their messages, I started to read through them and that was probably when it hit home. “When you play with your fellow professionals for years, they are the people you see in your day-to-day business. “It is unfortunate that I have had to retire, but I know I have the backing from them and I have said to them that I will see them round the club. Strenuous physical exertion is still a no-no for Barnett, who knows it was fortunate that the medical experts uncovered his heart condition when they did. He is set to undergo further tests to truly get to the bottom of what has caused his problem and to try and find if the problem is genetic. A few rounds of golf as lively as it gets for him at the moment, but he soon expects to be living as near to as normal a life as possible. And when he does, then he can really get stuck into the next chapter of his life, with football coaching high on the agenda. The Cobblers have agreed to honour Barnett’s playing contract which runs until next summer, and they have offered him the chance to enhance his coaching skills by working with the first team and also youngsters in the academy. “I will do my best with that,” said Barnett. “I am in the process of doing my badges anyway, although there are a few more that I want to get. “But any opportunity I get I will take, and I will try and pass on as much of my knowledge as I can to the younger ones and the players coming through, and even the older pros.